Twitter has finally released their official application for Windows 8 and RT. The app is completely unique to the Windows OS and is not a direct copy-and-paste from its iOS and Android counterparts. The Official Twitter app uses Windows 8 search and share features as well as its snap view, live tiles/notifications and the Discover tab which allows for individual tweets or photos to be highlighted and expanded. This application definitely offers more-OS specific features than we have seen with Twitter apps on iOS or Android. Things such as photos were developed heavily for Windows 8 to bring certain useful features like tap-for-fullscreen functions and the ability to view photo galleries from users. Basic Windows 8 functions seem to be universal such as the Search charm, and Twitter is no exception to that rule. Personally I think that the snap view ability is a very nice feature especially for Twitter as it allows you to view the main Home, Connect, Discover and Me tabs right on the side of your screen without interfering with other tasks. Microsoft did release a statement about the Windows 8/RT Twitter app saying ” the same design principles seen on Twitter.com and other Twitter mobile apps featuring the Home, Connect, Discover, and Me tabs. And the updated Twitter app for Windows Phone also uses the same design principles.” Of course the app uses some of the same recycled design from the other mobile and desktop versions of Twitter but it looks as though it fits nicely with Windows 8. 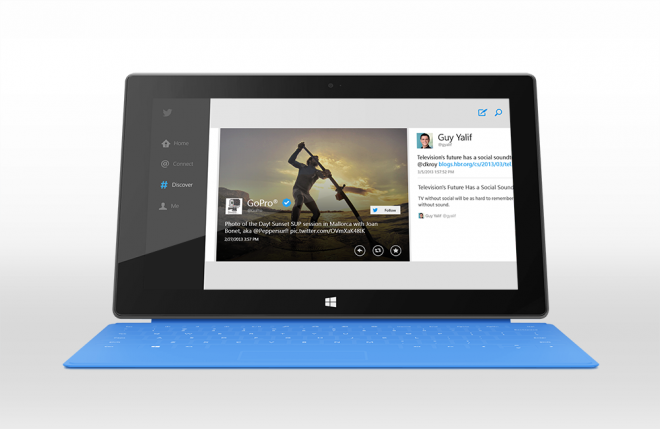 Die-hard Twitter users have already been able to use the service on Windows 8 and RT with third-party applications. However, Twitter has put major restrictions on third-party apps when it comes to multiple user support so it is nice to see an official Twitter app now available for Windows 8 and RT.